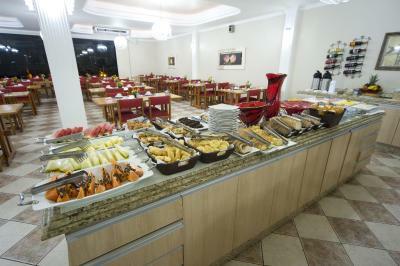 Big room.Comphortable bed.Location very close to the aeroport.The breakfast and the dinner were very good. The location and tge staff were amazing! The staff are very helpful even though it’s difficult for them to converse in english. 1) this was the cheapest option on the day that I reserved. 2) It is nearby the main attractions such as Bird park and Iguazu Falls. 3) The bed and pillow are comfortable. 4) it is easy to park there, one can find generally a space at any time. 5) the room is clan, especially the toilet is clean the hotel personnel is kind but this is the same as in all other nearby hotels we have been, in my experience people in Brasil are very kind. Beautiful, modern, clean hotel with spacious rooms. Great restaurant on the first floor. Location - convenient to and from the airport and the falls. I specifically requested quiet rooms away from the front and entry hallways, and got what we asked. to go to Iguazu falls, you just cross the street and walk about one block for the bus, or take a cab. Lovely breakfast spread with good variety. Great pool for kids to play in. 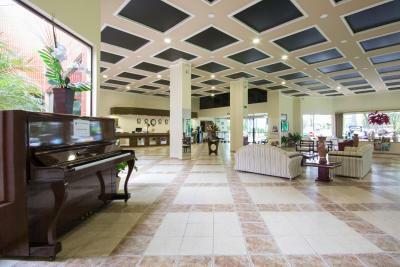 Hotel is just a few minutes drive away from the airport and Iguazu Brazil side. Has ok breakfast and dinner buffet. Pool area really big with slides for kids and a lot of sun lounges. One of the closest and more down-to-earth hotel to Brazil side of the airport and the waterfall. Bus #120 right in front of the hotel 3.8 Brazilian reals per person same ride to airport and the falls. The pool is a great feature to cooling down in the hot days when you just can’t keep hydrated enough. Staff are friendly and willing to help all the time. 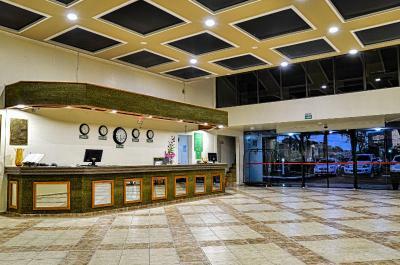 Hotel Nacional Inn Iguaçu This rating is a reflection of how the property compares to the industry standard when it comes to price, facilities and services available. It's based on a self-evaluation by the property. Use this rating to help choose your stay! One of our top picks in Foz do Iguaçu.Offering an outdoor pool and children's playground, Hotel Nacional Inn Iguaçu is set in Foz do Iguaçu in the Parana Region. Free WiFi is available and free private parking is available on site. The contemporary rooms at Hotel Nacional Inn Iguaçu have air conditioning, cable TV and a mini-bar. Bathrooms are private and include a hairdryer. Hotel Nacional Inn Iguaçu features stunning views of the surrounding greenery and has included this feature into its extracurricular facilities such as the soccer court and a games room. Birds Park is 2.6 mi from Hotel Nacional Inn Iguaçu, while Iguaçu Waterfalls is 6.2 mi away. 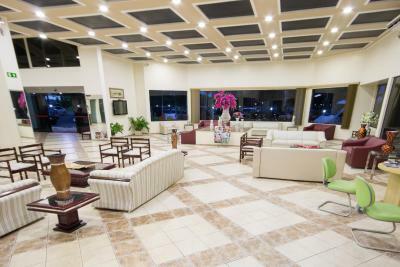 The nearest airport is Foz do Iguacu/Cataratas International Airport, 1.9 mi from Hotel Nacional Inn Iguaçu. 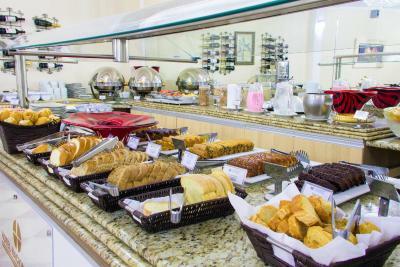 When would you like to stay at Hotel Nacional Inn Iguaçu? This air-conditioned room features cable TV, telephone, safe and minibar. It also includes a private bathroom and free Wi-Fi. This air-conditioned room features a TV, mini-bar and private bathroom with a hot shower. Please note that breakfast is not included. House Rules Hotel Nacional Inn Iguaçu takes special requests – add in the next step! Hotel Nacional Inn Iguaçu accepts these cards and reserves the right to temporarily hold an amount prior to arrival. Please note that the reservation's final rate will be charged in Brazilian Reais (local currency). Guests paying in other currencies are subject to the hotel's exchange rate which may differ from this website's. Wifi in the rooms did not work. Dinner buffet was not value for money and very basic. The hotel lookes a littlle bit old. Pretty tired, not all staff speaks English. Wifi was messy to connect, limits to one user per email. Water slides rusty, borderline to brake soon. The bathroom is not a room... No place to dry your clothes in the room or outside. No telephone on the room to call for room service so we always have to go out in the front office. It was quite dingy in many respects. Lobby doors constantly open meant lots of insects inside. Also, the lighting and interior was quite depressing. Location and price were a good value. The town is 30 minutes away so that takes your conscience off to access of restaurants and cheaper supplies. But you trade the space for the distance it is not a complaint for the price you pay. Thin walls! Two guests next door spoke/sang until the wee hours of the morning (girl and father?) and sounded as though they were in the same room with us. We only found one employee (Jonathan) who spoke enough English to communicate, but that just tells us we need to brush up on Spanish. Portuguese is impossibly difficult! Nice location and you could just take a bus from the airport leaving every 20 minutes (bus 120) for less than 4 real. Staff was nice and actually some of them knew English. Very child friendly, a bit loud if you don’t like kids. During the evening we heard a lot of screaming kids in the hallway from our room (earplugs was necessary). But we went to bed before 22.00 when we stayed here so it might not be a problem if all kids are sleeping. Clean and big room. Huge pool with 3 slides great for kids. Very clean, great breakfast, good entertainment opportunities: swimming pool, tennis, ping pong. Big thanks to the personal for working hard on it! Near to Waterfall, take No.120 for 10 minutes. But far away from downtown. Convenient to take bus for transportation to any where. Check-in. We wait like 20 minutes. Location to airport & Falls Good value for money Staff organised personal English speaking guide & transport to Argentinian side which was great. there were so many cakes! !